An estimated 7 million people report allergies to seafood, including fish and shellfish. Salmon, tuna, halibut, shrimp, crab and lobster are the most common kinds of fish and shellfish to which people are allergic. 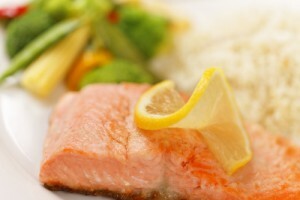 A fish allergy is considered lifelong; once a person develops the allergy, it is very unlikely that they will lose it. Blood test – A blood test, also referred to as an IgE test, measures your immune system’s response to the proteins found in seafood by counting the number of specific antibodies in your blood. Fin fish – Salmon, tilapia, catfish, hake, orange roughy, tuna, etc. Shellfish – Clams, crab, lobster, mussels, oysters, scallops, shrimp, etc. A new diagnosis can be scary. Be sure to build a support system of family, friends and healthcare professionals to help you manage your fish and/or shellfish food allergy. Talk to a doctor or registered dietitian when eliminating foods from your diet about possible vitamin and mineral deficiencies. They may recommend an adjustment in your meal plan or a supplement to replace nutrients lost by eliminating the offending food and food ingredients. Also talk to your doctor about how to prepare for a reaction. You may treat a mild reaction with oral antihistamines to reduce signs and symptoms and relieve discomfort. If you are at risk for severe reactions or anaphylaxis, your doctor may advise you to wear a medical alert bracelet and/or prescribe an injectable epinephrine (EpiPen) to carry with you at all times. The Weis Markets’ Healthy Living website does not provide medical advice, diagnosis or treatment. The information provided on this website is intended for general consumer understanding and education only. It is not intended to be a substitute for professional medical advice. The content is not intended to be used for medical diagnosis or treatment. Additionally, as health and nutrition research continuously evolves, we do not guarantee the accuracy, completeness, or timeliness of any information presented on this website.